The HTIG and its subordinate units have completed construction of expressways with an accumulative total of 3878km, accounting for 66% of a total 5859km of expressways in Henan. Currently, HTIGruns 3107km of expressways, accounting for 53% of the provincial total mileage, such as Beijing-Hong Kong-Macau Expressway, Lianyungang-Khorgos Expressway, Shanghai-Xi’an Expressway, Daqing-Guangzhou Expressway, Erlianhote-Guangzhou Expressway etc. in Henan Province.HTIGhas made outstanding contribution to Henan expressway construction maintainingits leading position in expressway mileage nationwide for 8 consecutive years. During projects construction, HTIGinsists on the people-oriented scientific development conceptand keepspursuing high qualitythrough the whole process of expressway construction which includes planning,engineering investigation, designing and constructing.We strive to build better projects by manifesting the harmony in designing, promoting the balance in construction, pursuing advancement in technology and science, placing people first in environmental protection and enhancing quality management. During operation management, HTIG strengthens the management of standardization and elaboration in toll collection, road administration, maintenance, service area management, mechanical and electrical operation and maintenance and so on. 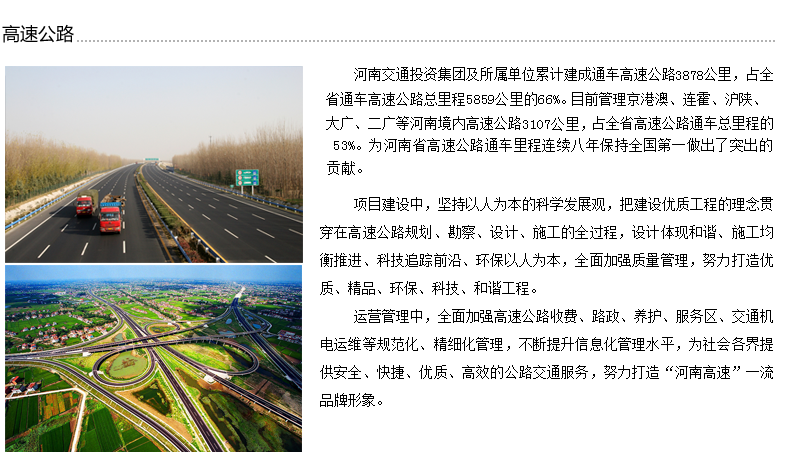 We keep working on promoting information management and providing road services with reliability, convenience, high quality and efficiency so that to make “Henan Expressway” to be the first-class brand.